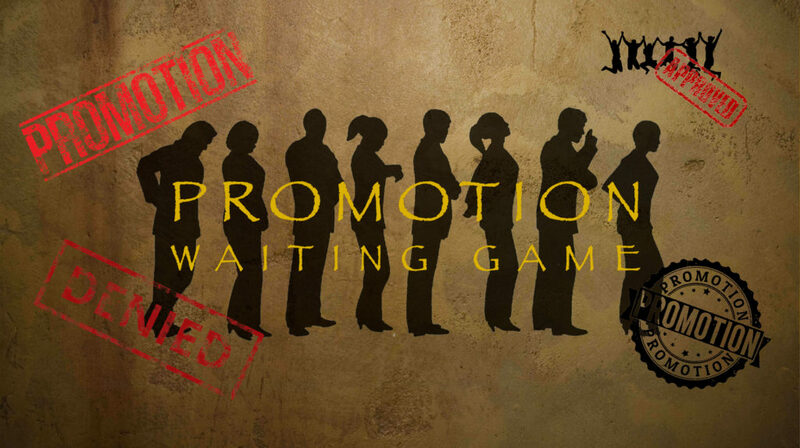 Many people have asked me “What do I have to do to get promoted?” I get this question about “The promotion waiting game” mostly from high-performing individuals who are accustomed to receiving frequent and meaningful promotions, but for some reason have stalled out. This is a difficult question to answer, because there are a lot of variables which impact promotions. I wrote this article to share my perspective on promotions and some of the things you can do to improve your odds of being promoted. Promotions are great because they usually result in a better title, more responsibilities, and most importantly an increase in financial compensation. The promotion may re-energize the recipient, strengthen their loyalty to the company, and they may become more engaged in their work. For those individuals anxiously waiting to experience this exhilarating event, I offer the following advice. Be Patient – My first advice is to be patient. Impatience shows, and it sends the wrong signal. Don’t let impatience cause you to dwell on the promotion and divert your focus from the business priorities. I have seen this happen to people and it is disappointing to see someone with great abilities have their career derailed due to impatience. Be Prepared – Promotions into a role are done when a candidate meets the skills and experience requirements. Not all candidates that feel ready for a promotion have actually met the requirements. Make sure you understand what those requirements are and whether you meet them or not. If you don’t, then these become development areas. Be Informed – It is common for people to believe that they should be promoted because they have performed well, and they have met the required criteria. In fact, that’s only half of the equation. An open and approved position must be in place for the promotion to happen. This is especially true for executive promotions. No approved, open position usually means no promotion. Be Clear – Some people assume that they are being considered for a promotion. Don’t assume this is true. It is important to let your manager, human resources representatives and the key decision makers know that you are interested in a promotion. Standing by and waiting for it to come may lengthen your wait when you haven’t made it known that you are actively seeking a promotion. Be Aware – It is imperative to pay close attention to your brand, and more importantly to do whatever it takes to protect it. Read the article I wrote on Personal Product Management to gain more insight on how to manage your personal brand. Be Seen – Showcasing your skills and being visible is another way to increase your odds of being considered for a promotion. Being visible means volunteering to lead and do the work for high visibity projects, not merely requesting meetings with key decision-makers which may be viewed as disingenuous. Be Ready – Some companies practice what is referred to as “try and buy.” This is to say that they will ask someone to take a role to “prove themselves” prior to a promotion being handed out. My advice in most of these cases is to take the role, don’t complain and do a great job. Even if a promotion is not awarded, the experience is invaluable. Be Positive – Dealing with disappointment is difficult, especially when expectations are high. The best thing to do in this case is to keep your thoughts to yourself, don’t let your performance degrade, don’t gossip or be vocal with anyone, especially people in leadership roles. It will damage your brand and it may impact future promotion opportunities. Be Strong – It is easy to have an emotional reaction to not being promoted. I’m not talking about tantrums, but decisions to make illogical job changes out of frustration. Job changes made out of frustration often do not fit the long-term career plan. Be Informed – If possible, try to find out what happened. Seeking out why you were not promoted must be done tactfully and without emotion. Finding the right person to have this conversation with is important. Remember there is no “safe” person to talk to, so tread lightly. Be Calm – One of the most impactful and emotional reactions is when an individual finds out that the company hired someone from outside. This has happened to me and it is a fairly common practice in large corporations. There are many reasons why this may be done. Corporations may want to bring in new talent from outside to foster new ideas or provide a new direction. Either way, my advice is to control the level of disappointment and guard against any emotional reactions. Be Coached – I’m not making this recommendation for selfish purposes, but because I believe that working with a coach can help identify gaps and block a potential promotion. A coach can be a great way to develop needed skills to improve the odds of a promotion. Waiting to get promoted can be a very exciting time in a career. Receiving the promotion can be life-changing, while an unsuccessful attempt can lead to deep disappointment. I hope that the information in this article will be helpful notwithstanding the outcome of a promotion opportunity.